This recipe makes a large batch of one of America’s favorite soups. It’s creamy, cheesy, and perfect for a simple dinner party. Soup might not seem the obvious choice for a dinner party, but make a big batch of crunchy sourdough croutons and serve them alongside the soup for a decadent meal that will allow you to actually spend time with your guests. Melt 1 tablespoon butter in inner pot of pressure cooker set to Sauté on High. Sauté onion in hot butter until onion is softened, about 3 minutes. Press Cancel. Stir broccoli, vegetable stock, carrots, and celery into onion. Lock pressure cooker lid in place and set steam vent handle to Sealing. Select Pressure Cook and cook on High Pressure for 1 minute. Let pressure to release naturally for 5 minutes, then turn steam vent handle to Venting to quick-release remaining pressure. Melt ¼ cup butter in a saucepan over medium heat. Whisk flour into butter to form a thick paste. Increase heat to medium-high. Slowly pour milk into butter-flour mixture, whisking constantly, until smooth. Cook, whisking constantly, until milk thickens, 2 to 3 minutes. Add Cheddar cheese to milk mixture and stir until melted. Stir cheese mixture into vegetable mixture in inner pot of pressure cooker. Whisk cornstarch and cold water together in a small bowl until smooth. Select Sauté on High. Pour cornstarch mixture into soup in a steady stream, whisking constantly, until soup thickens to desired consistency, 2 to 4 minutes. 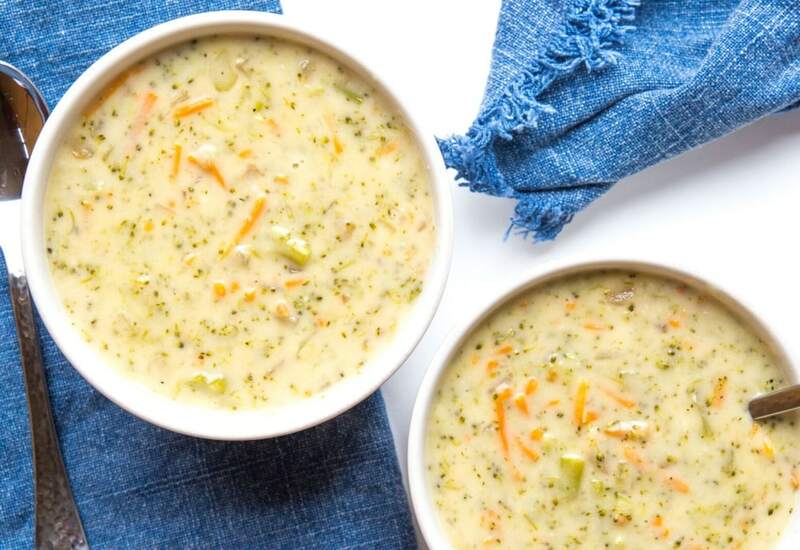 Ladle soup into bowls and serve immediately. Try different cheeses to go with the Cheddar cheese. Use half shredded Gruyère cheese and half shredded Cheddar cheese. Or try half finely grated Parmesan cheese and half Cheddar cheese. Add small pieces of cauliflower in addition to (or instead of) the broccoli for a different cruciferous experience. Per Serving: 571 calories; 38g fat; 37.6g carbohydrates; 23g protein; 106mg cholesterol; 1045mg sodium. I made it today. Pure perfection. I didn’t add any extra thickening. Just plenty thick and tasty. I added some salt though. I made home made buttery croutons to go with that. Yum. It’s just perfect! I used blender to turn it into a cream soup and it worked out soooo good! Thanks! I DOUBLED the amount of sharp cheddar cheese and added sea salt & fresh pepper to taste (as some reviews suggested) and I used a potato masher to "cream" it. It was DELICIOUS with some French baguette!!! Highly recommend!!! You had be at Panera Bread! This recipe is spot on. I would not change a thing. I did use the thickener and found that the texture and consistency was perfect. The only thing I felt like I needed to add was a little salt. Other than that, it was perfection. We really like it. It's not as milky-creamy -thick as Panera. More veggie tasting. I will use less carrot next time as our family preference. I added about 7 more ounces of cheese than what the recipe called for totaling 15 ounces of cheese. I used the cornstarch thickening with ratio of 3 TBL. Prep a lot longer than 15 minutes! But that may be because I'm slow at cutting up veggies. Overall, I will make it again. I made this recipe tonight and it was phenomenal. I even got my kids to eat it, and they never eat soup. This recipe taste just like the real thing, and it's cheaper than going to Panera! Your recipe was sooooo DELICIOUS!! Followed the recipe, added these because I needed to use them up before they went bad: Leeks (1 stalk) 1/2 onion 1c Spinach 1c zucchini 1c yellow squash Extra cup of broth Used salted butter but added a little more salt and pepper to taste 1 cup of heavy cream at the end...because i decided to grate purple carrots and soup came out...purple. Family loved it, thank you! We loved it. My kids gave it a 6. My little on (she is 9) said she would give it a 10 if it wasn’t for the carrots because she just didn’t like them in there, but didn’t hate them. That being said, they loved this soup and it was very easy to make. Oh, and I didn’t add the corn starch at the end because we like it a bit more soupy and less thick. Ohhh! Soo good!!! This was a super quick and easy recipe as well. It needs a good bit of salt and some pepper but, aside from that, tasted great! EXCELLENT recipe! Came out great in my Mealthy Pot. Excellent, I followed the recipe exactly until the end. It has excellent flavor but I like more cheese so I added another half cup of cheddar cheese and salt.. that’s it. I had enough for a meal for three and I froze two more family portions. Will make again for sure! This recipe lived up to its reputation. As good as the Panera version , if not even better because the soup can easily be altered to your specific tastes. One word... Amazing!!!!! Okay, it deserves two... Delicious!!! This was perfect, the recipe was easy and it came out wonderful. My first time making soup in my instant pot! This soup was absolutely amazing! Defiantly will be making again!! This was my very first pressure cooker meal! It turned out delicious and creamy! I didn’t have celery so I left it out, and also added salt & pepper at the end. Very easy to make!